Apparently, there are no alligator clips at ITP, so I had to improvise with wire, copper tape, and paper clips. 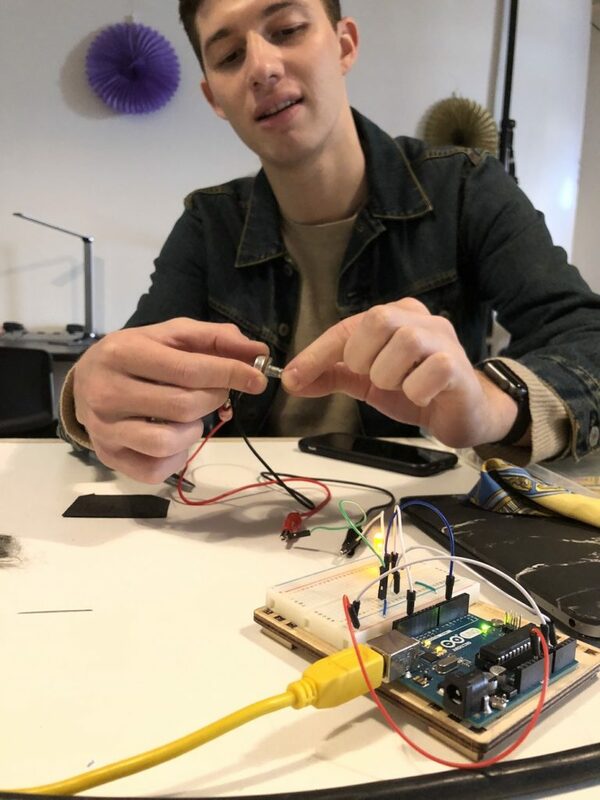 As we were all intrigued by the possibilities of conductive thread, our “research group” decided to explore making the stroke sensor we saw on How to Get What You Want. 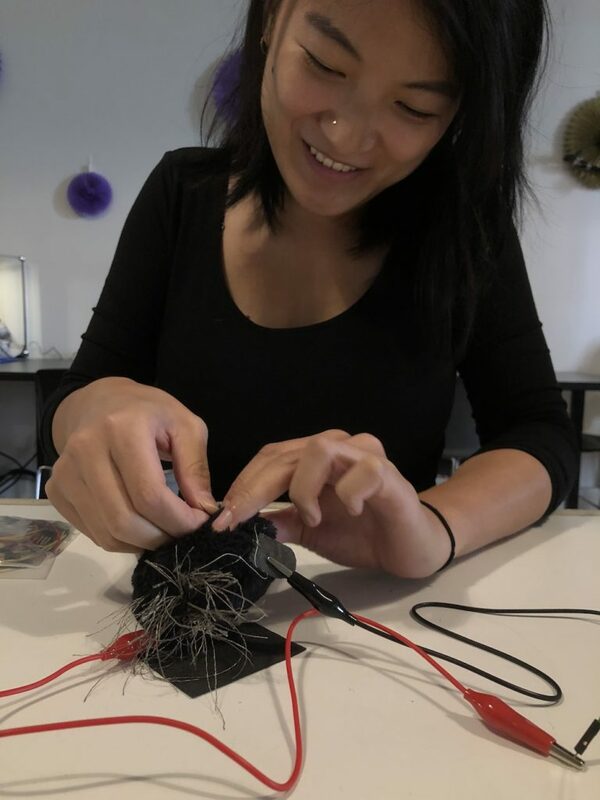 Instead of using a piece of conductive fabric on the backside, we opted to use the Eeonyx StaTex Conductive Fiber as filling for an amorphous plushie. This way, it would be able to detect pressure as well. So many fun things! Not pictured: Alan, who was doing the documenting. Thanks Alan! 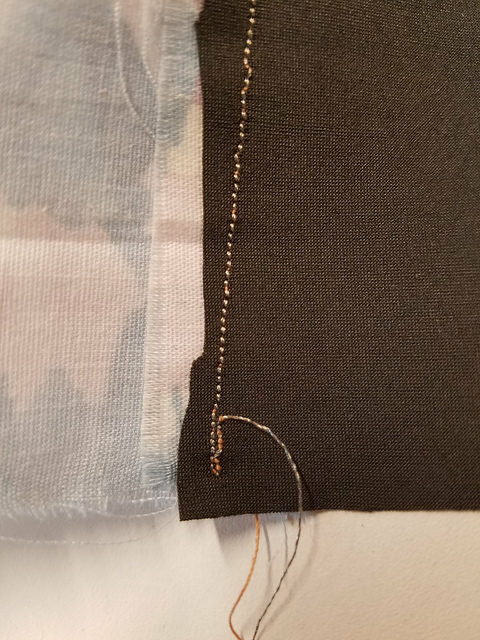 For the materials testing lab, Erin and I were able to experiment with different conductive materials: Velostat, Eeonyx Pressure Sensing Fabric, Eeonyx Stretch Sensing Fabric, and Eeonyx Conductive Fiber. 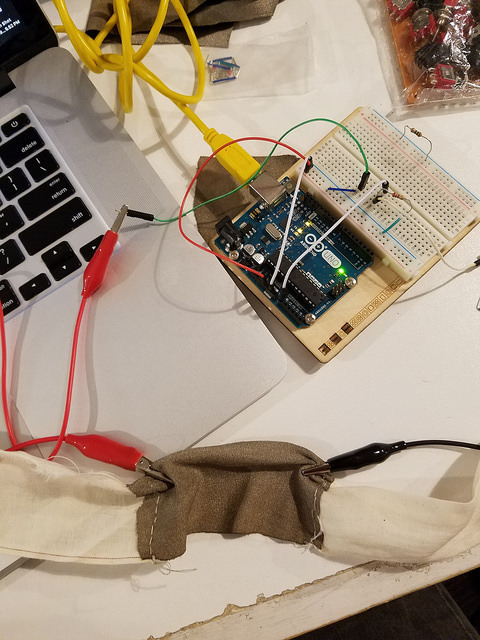 Velostat and the pressure sensing fabric needed to be “sandwiched” in a non-conductive material, with conductive terminals for power and ground to be connected to the multimeter; the stretch sensing fabric and conductive fiber only needed to be clamped with alligator clips. At rest, the velostat had a resistance of 24.5k. To test it, we 1) applied pressure, which yielded a resistance of ~26k, 2) bend it, which yielded a resistance of ~30k, and 3) twisted it, which yielded a resistance of 35k. The pressure sensing fabric had a resistance of about 3.5k at rest. To test it, we 1) applied pressure, which yielded a resistance of ~3.1k, 2) bent it, which yielded a resistance of ~2.5k, and 3) twisted it, which yielded a resistance of 2.2k. 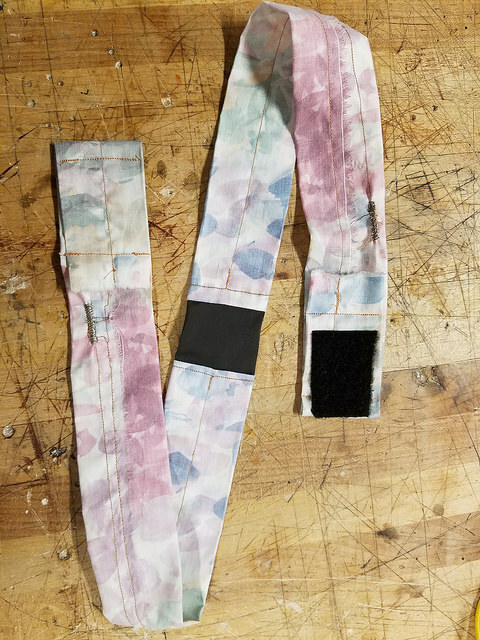 The stretch fabric had a resistance of ~140k at rest. When we 1) applied pressure, the resistance dropped to ~129k, 2) stretched it, the resistance dropped to ~95k, and 3) twisted it, the resistance dropped to 123k. The conductive fiber had a resistance of ~2.2k at rest. When we pressed it, it dropped to a value of 1.5k. 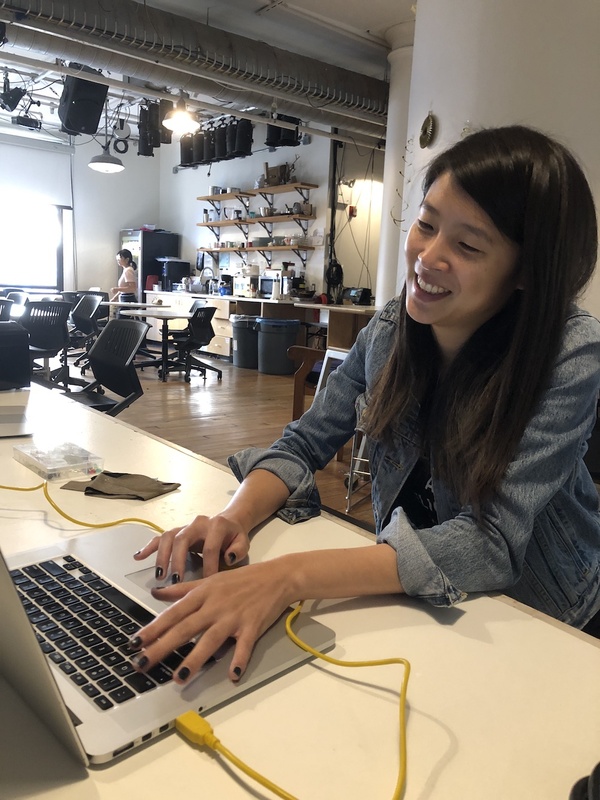 When we convened for our group exploration, one of our group members had an idea that she wanted to work on alone, so we ended up doing our own thing in close proximity to each other. 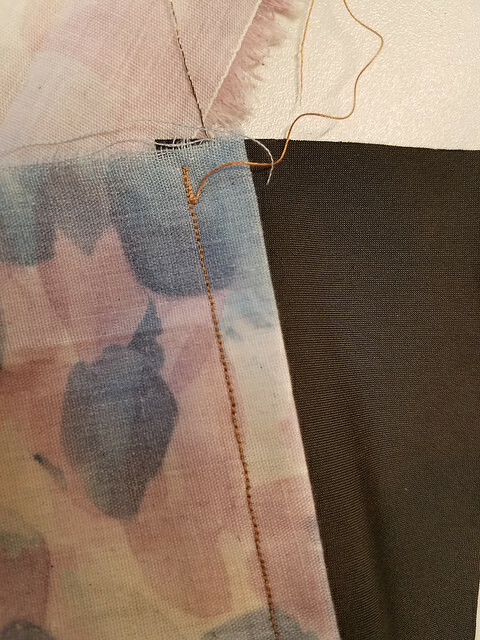 I had initially used the grey mystery fabric—since there was more of it—but it didn’t yield very good results: the analog read ranged only from 1014 at a relaxed state, to 1016 at a fully stretched state, using a 220ohm resistor. 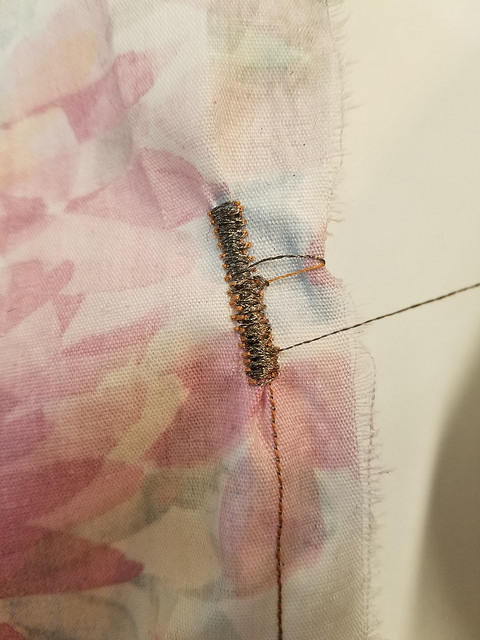 The Eeonyx fabric was much more responsive, giving an analog reading from 870 in a relaxed state, to 950 in a fully stretched state, using a 1M ohm resistor.